Lutron AM-4100B Anemometer + Temp. 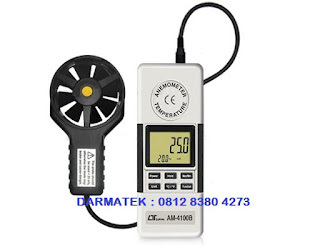 * Anemometer use low-friction ball bearing mounted Operating 0 to 50 ( 32 to 122 ).wheel design provides high accuracy at high and low air Temperature velocity. Operating Max. 80% RH. 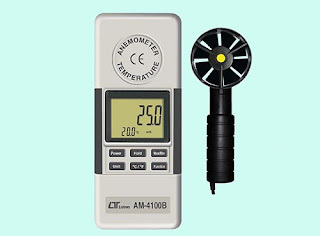 * Anemometer use the separate heavy duty probe, Humidityconvineant for the measurement. Sampling Time Approx. 1 second. * Standard type K ( NiCr-NiAl) thermocouple input jack Weight 432 g/ 0.95 LB ( w/ o battery ) .suitable for all kinds of type K probe. Dimension Meter : 170 x 70 x 39 mm ( 6.7 x 2.8 x 1.1.5 inch) . * Concise and compact buttons arrangement,easy Anemometer probe head : operation. Round, 76 mm Dia. * / detection by pressing button on the front panel. equivalent. * Alkaline or heavy duty type.button on the front panel for five kinds of units. Power Battery power : Approx. DC 10 mA. * Auto power shut off to battery life or manual power off. * Using the durable, long-lasting components and a strong ELECTRICAL SPECIFICATIONS ( 23 ± 5 ) lightweight ABS-plastic housing case.